Many of our residency program are available not only during the school day, but after-school as well. Please contact us for more information. InterAct artists conduct arts-based workshops for child care providers, after-school programs, and extended learning programs throughout our local area, for such partners as the Housing Initiative Partnership's HIP Kids program, the Prince George's County Before and After School Extended Learning Program, the Montgomery County Public Schools Extended Learning Opportunities program, Excel Beyond the Bell, and more! Also, if you are looking for a quality literature-based after school program for elementary schools, may we recommend our good friends at Creative Kids? 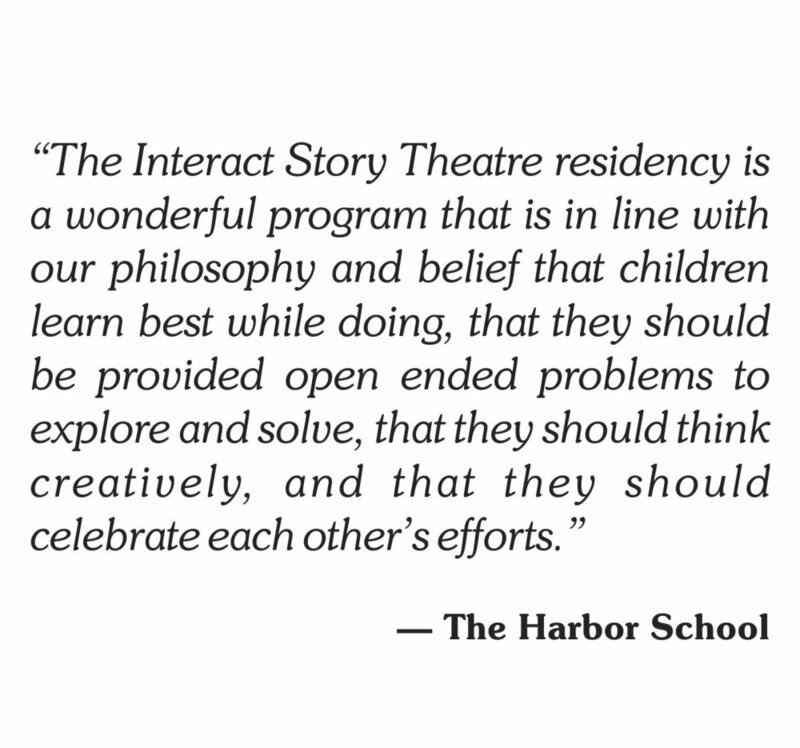 Creative Kids is the afterschool drama program created by InterAct's founder, Lenore Blank Kelner. For more information, please visit http://lbkcompany.com/after-school-creative-kids.htm, and let them know that InterAct sent you! Students have fun diving into an array of children’s books and folk tales—acting, moving, dancing, singing, and playing their way through books! Students build language and literacy skills as they have fun learning to use their acting tools and skills and sharing stories. In this exciting and fun-filled residency, one or more InterAct teaching artists lead students in a variety of increasingly challenging improvisation and activities over the course of the session. The program can include an optional culminating event showcasing original scenes developing from our improvisational work. Students explore character and scene work as they engage in a program designed to promote concentration, collaboration and teamwork, cooperative learning, critical thinking and creative problem solving. In this drama-based writing residency, students use creative drama techniques and group writing strategies to write and perform original stories and scenes. 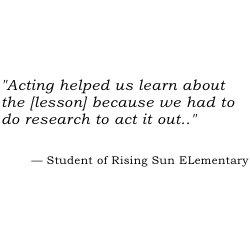 In doing so, students learn and apply basic acting tools and elements of story structure as they practice collaboration and appropriate peer review. This process builds prewriting skills, oral language and presentation skills, problem solving skills, and teamwork. Themes can be drawn a variety of character education topics or curriculum content. Students learn how opera combines music and drama to tell stories by transforming stories and events into original musical scenes of their own! By using acting tools and skills along with the basic elements of music, students create their own original operas. Students explore a preselected topic, story, or book and transform their ideas into musical scenes, from solos to ensemble songs for the whole group. See how much fun storytelling with music can be!